Figure 1: X-ray diffraction probe measuring a welded pipe. X-ray diffraction (XRD) is a (mostly) non-destructive technique for measuring residual stresses in engineering structures . It is one of the most mature non-destructive methods [2–4]. For that reason, it is highly regarded in industry and academia. XRD measures a thin layer near the surface (a few microns) . Multiple measurements can be made across a surface to produce a map of the in-plane residual stress state. To produce depth profiles thin layers of material can be removed incrementally before each measurement. 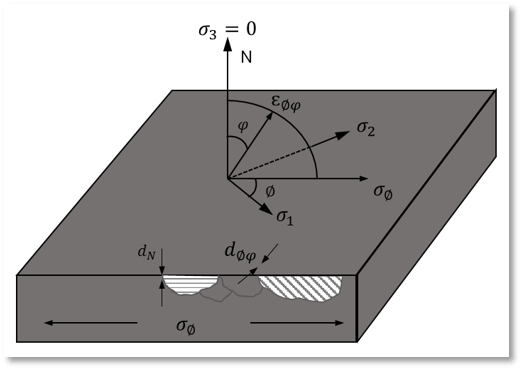 This technique is particularly attractive when near-surface residual stress measurements are required. It is most useful for evaluating residual stresses from machining, peening, heat treatment and similar processes. As in all diffraction methods, X-ray diffraction can measure residual stress using the distance between crystallographic planes, d spacing, as a strain gauge, as shown in Figure 2. When the material is in tension the distance between crystallographic planes increases and when under tension this distance is increased compared to the unstressed condition. The lattice spacing is calculated from the diffraction angle, 2θ, and the known x-ray wavelength using Bragg’s Law  (Figure 2). The strains are measured by placing the sample in a X-ray diffractometer. The specimen is then exposed to an X-ray beam that interacts with the crystal lattice and cause diffraction patterns (Figure 2). StressMap has suitable X-ray diffractometers for both laboratory and on-site measurements. Figure 2: Infographic of the principle of X-ray diffraction for residual stress measurements. Where E is the Young’s modulus of the material and ν is its Poisson’s ratio. This method of analysis based on plane stress assumption is referred to as the φ technique. Figure 3: Plane stress at a free surface showing the change in lattice spacing with tilt φ for a uniaxial stress σ_∅ parallel to one edge. When depth profiles are required, electro-chemical machining is used to remove material before each measurement. This material removal technique does not introduce additional residual stresses, which is crucial for the accuracy of the results. A correction is normally required to take into account the stressed material that has been removed. With permission from our partners, we showcase selected measurements using the X-ray diffraction (XRD) in our projects page. Check them out here. We are constantly working to add more examples, so if you want to learn about our latest updates, follow us on LinkedIn, Facebook or Twitter. Bragg, W. L. (1929). The diffraction of short electromagnetic Waves, Crystal. Scientia 23 (45):153. Withers, P.J. ( 2007). Residual stress and its role in failure. Reports on Progress in Physics, 70(12): p. 2211. Rossini, N.S., M. Dassisti, K.Y. Benyounis, and A.G. Olabi (2012), Methods of measuring residual stresses in components. Materials & Design, 35(0): p. 572-588. Withers, P.J. and H.K.D.H. Bhadeshia (2001). Residual stress. Part 1 – Measurement techniques, Materials Science and Technology, 17(4): p. 355-365. Fitzpatrick, M.E. and A. Lodini (2003). Analysis of Residual Stress by Diffraction Using Neutron and Synchrotron Radiation, Taylor & Francis.